NETWORK UPDATE: GRIMM lost 0.1 in final Friday ratings. WORLD SERIES GAME 3 adjusted up to 3.1 from its 2.5 preliminary rating. Discovery’s GOLD RUSH led Friday cable again, down a single hundredth to 1.17 from last week. Its lead-in GOLD RUSH: THE DIRT was dead even at 0.54 (4th place for the night), and its lead-out EDGE OF ALASKA was at 0.64 in 2d place. Syfy’s WWE show was at 0.61, down 0.09 from last week. 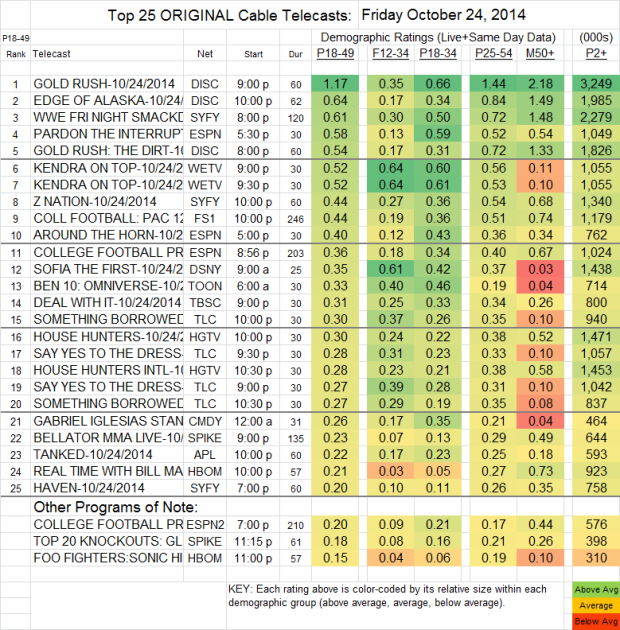 HAVEN started that network’s night at 0.20, down 0.06, and Z NATION followed wrestling down a tenth at 0.44. Two episodes of KENDRA ON TOP (We) were at 0.52, up 0.11 from last week. COLLEGE FOOTBALL was at 0.44 (FS1) and 0.36 (ESPN), the latter down 0.17 from last week. REAL TIME WITH BILL MAHER (HBO) lost 0.13 to 0.21, and a FOO FIGHTERS special followed it at 0.15. A few additional shows that didn’t make the chart: ON THE MENU (TNT) was at 0.10 in 18-49s, with 498K total viewers, and on IFC, COMEDY BANG BANG had its best rating at 2AM (0.05/128K), ahead of its 0.04/59K at 11PM, with BIRTHDAY BOYS at 0.04/81K at 11:30PM and the same 18-49 rating but with 121K total viewers at 2:30AM.